just a quick one, since ESPN published a new kind of adjusted Plus-Minus yesterday (called real Plus Minus, RPM). I don't want to go too far into the merits of either stat. I am pretty sure that RPM has problems like every adjusted PM before and PER is basically just 'boiling down more common stats to one number', but it were the two things I just had at hand. If somebody gives me a table that has both RPM and another adjusted plus minus, I'll gladly repeat the following, which is doing a simple linear regression. I know the word sounds dangerous, but linear regression is basically complicated for ' draw a line through your data and check how far stuff is away from this line'. 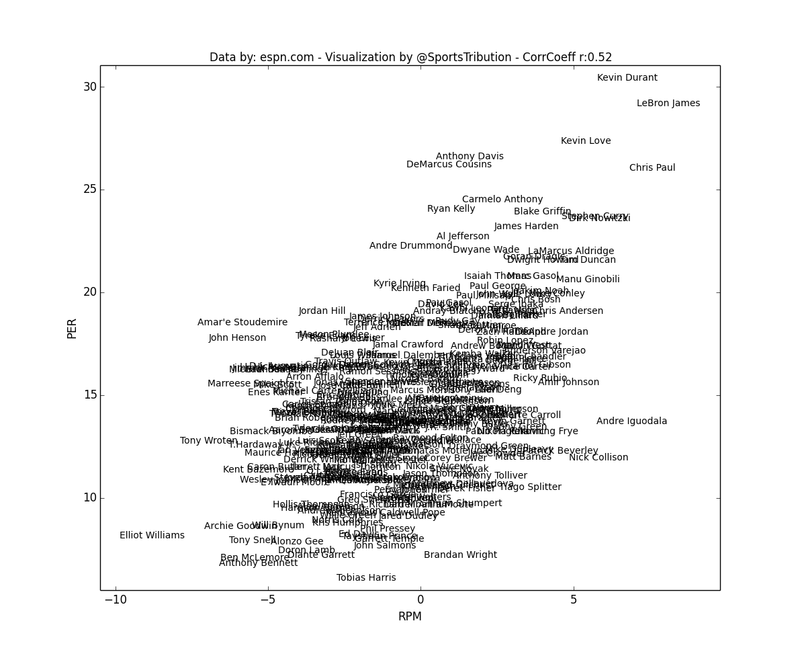 Using 293 players that played at least 48 games, the correlation between RPM and PER is 0.52, which can be described as 'existing, but not very high'. 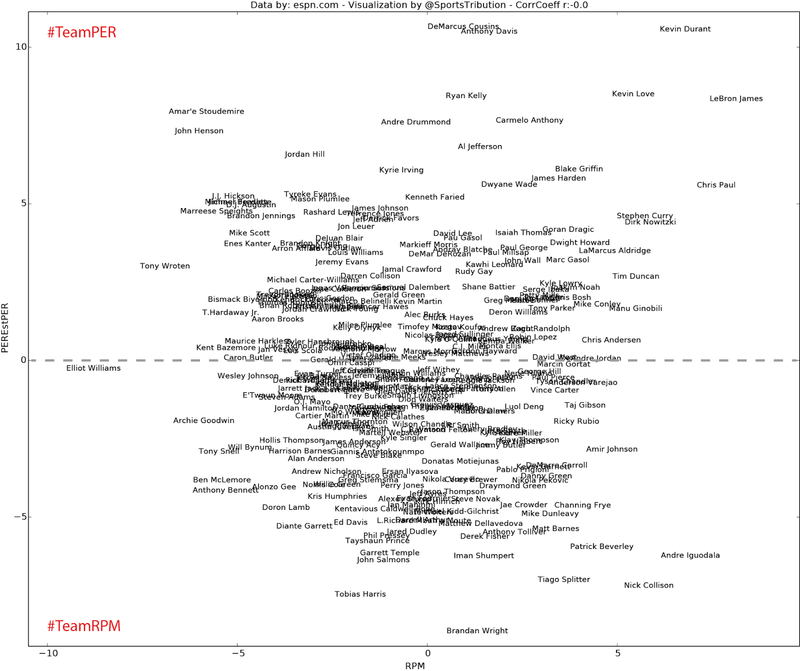 As you can see, the top of the game are still LeBron and Kevin, but there are some clear outliers. To summarize it, unsurprisingly PER is good at showing us those players that are producing measurable stats, while RPM finds players that might produce more by intangibles. And Kent Bazemore is not good in both stats - because they don't adjust for super-bench-celebrating! Yes I dislike acronyms - especially if I am not familiar with them. Maybe you might be as kind to write them once out for dummies like me. sorry, I was in a bit of a hurry yesterday. RPM stands for real Plus-Minus, a stat based on the idea 'does your team score or allow more or less points when you are on the field?'. and PER stands for Player Efficiency Rating, which is short for 'we take all the common stats (Points, Rebounds, Assists, etc.) and boil them together in a smart way, to get one mega-metric'.